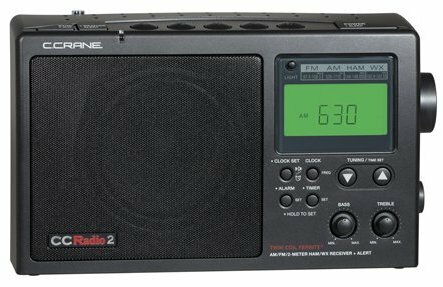 One of my very favorite contemporary radios is C.Crane’s flagship AM/FM portable radio – the CC Radio 2. This revised version is called the CC Radio 2E Enhanced and I’ll tell you right now, it is an immense step forward – most noticeably in its AM sound quality, but in several other respects as well. C.Crane has redesigned the radio’s circuits around an entirely new chip, so although the new version looks outwardly identical to the older CC-2 the radio has been thoroughly revamped. As I said the new model looks identical and has the same basic functions and features…only the performance has been enhanced. The biggest area of improvement is sound quality. All the previous versions of the CC Radio (the original CC Radio, the CC Radio Plus, and the CC Radio-2) had AM sound that was bandwidth limited…they sounded muffled. The original design goal was to make AM noise less objectionable, but the problem was that this limited audio bandwidth restricted the AM sound quality on ALL signals…even clear ones. Because of this, C. Crane’s own CC Radio-SW and CC Radio-EP both sounded far better on AM than the flagship CC Radio. Now that has all changed – the new CC Radio-2E is among the best sounding AM portables I own. It has rich audio with a nicely balanced frequency response, punchy bass and clear treble, and the bass and treble controls are now far more useful. Yes, you can still cut down the treble if you have a very noisy signal, but for most listening you will appreciate that the sound is now much more alive and open…for its size the radio pours out a very robust sound that is lots of fun to listen to. I put it side by side with a CC Radio-SW (noted for its excellent audio) and find the CC-2E sounds just as nice…maybe nicer. The two radios have a different frequency balance with the CC-SW giving a bit more midrange compared with the CC-2E’s more recessed midrange providing apparently greater bass and treble, but I can’t say one is better than the other…they are different but both excellent for portables. The CC-2 also competes well with the GE Superadios, also known for excellent sound…clearly the CC-2E is about as good as it gets for AM sound in this product category and that is an achievement. Excellent AGC Characteristics: The CC-2E also does an excellent job with those fluttering, wavering AM signals you may hear early mornings, evenings, and at night. This is usually related to the time constants of the AGC…comparing the CC-2E with the original 2, the 2E makes these signals sound much more stable and less noisy…stations that had pulsing bursts of noise on the original 2 are just much more pleasant to listen to on the 2E and in this regard it compares favorably with any others I compared it with. Sound Quality on FM is also improved rather dramatically over the older model with much more treble and more bass too…it just sounds very nice. RF Performance: This improved sound is especially exciting to me because the CC-2E is also as good as it gets for AM/FM reception in a portable*…it is super sensitive and achieves nice quiet backgrounds on medium to weak AM signals. Judging AM portables for sensitivity is best done in the daytime, listening to how much noise is present in the background of medium to weak signals. (You have to be in an area relatively free of RFI – Radio Frequency Interference to judge a radio’s sensitivity…if the background electrical noise is high it will become the limiting factor in reception and you will not be able to tell how low the noise floor of the radio is…see my article “Combating RFI” at the top of my home page). *Some vintage analog radios such as the Panasonic RF-2200 match the CC-2’s sensitivity, and with their wide dynamic range also resist overload in high signal areas better than most modern portables can. If you live very close to AM transmitters the CC Radio-2 may not be your best choice but in the vast majority of locales it will pull in AM signals better than anything else. The 2E seems to have slightly improved its ability to handle strong AM signals. I also recommend everyone do the Auto Alignment Procedure as described in the manual. This will ensure top reception. I have tested several samples of the CC-2E and also the new CC-3 and all of them improved after this simple procedure. Start with the radio on tuned to the AM band. Press and Hold the Clock button for about 4-5 seconds. The red WXA light will illuminate. Tap the Clock button again. The radio will then start to align itself. The radio will begin to slowly count down from the top of the AM band down to 520. Do not interrupt the process. It takes about 3 minutes to complete. The last step is to press and release the reset button on the bottom of the radio with a paperclip when the alignment is complete. FM reception has also been improved…comparing the CC-2E to my older CC-2 the enhanced model was still excellent in sensitivity but more selective…it was able to pull in some problem signals much more clearly and now ranks among the best FM portables I have tested. Soft Muting: One quibble…the DSP chip used in the CC-2E has some amount of soft muting which reduces the volume when you purposely tune slightly off the center of a signal, such as when trying to help with adjacent channel rejection and occasionally on some medium strength signals. Luckily I have found that if I use the tuning knob to off tune by 1 increment, then re-tune, the station comes back in at full volume. Also, the CC-2E does not seem to mute weaker signals as many current day radios with soft muting do…the radio received signals right down into the band noise as well as or better than any radio I compared it to. So luckily it does not impact reception in most cases. This is the sort of radio question I receive on almost a daily basis but it’s usually impossible to answer without more information. If the signal simply does not exist in your particular location, no radio will pick it up. Shielded and/or noisy locations such as office buildings and apartments can block reception in ways no radio can compensate for. But if a signal is receivable the CC-2E Enhanced should do as well or better than any other AM portable you compare it with. Unfortunately there is no right or wrong answer…it’s a personal decision based on your preferences and priorities. 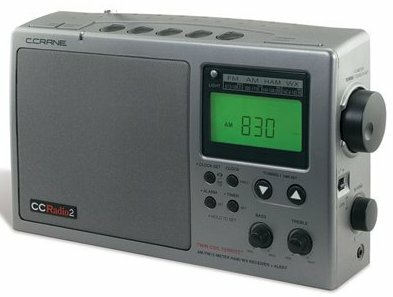 The older version CC-2 is still the excellent radio it was last month so if you are using one and are happy with it by all means continue to enjoy it. On the other hand, if you have felt your CC-2 was pretty much everything you wanted but you were less than thrilled with its sound you will be thrilled with the improved version and you’ll get slightly improved reception to boot. 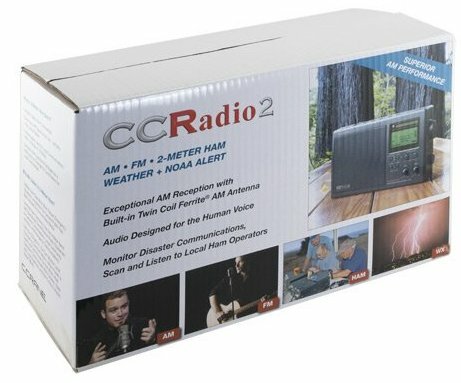 The name CC Radio 2E Enhanced is apt, for in most outward respects it is the same radio but many areas of performance have been significantly improved. And if you’re like me and you just love really good radios, the new CC-2E Enhanced is a must have. In the world of portable radios it is a new reference against which all comers must be compared…it’s that good.